San Francisco welcomed Beau and me with open arms and we can’t wait to share with you all of the fabulous pet-friendly places, activities, restaurants and resources we discovered for the perfect San Francisco trip! From Golden Gate Park to the Squaw Valley Ski areas San Francisco welcomes you and your pet with wag-worthy access! Usually, this is where Beau & I share our favorite pet-friendly dining opportunity in each city, but what we discovered in San Francisco goes way beyond one or two dining suggestions. You must visit Dining With Sophie. Dining With Sophie is a magnificent collection of pet-friendly restaurants in San Francisco, organized by neighborhood! This website is such a great resource, so be sure to bookmark it. If you are a pet-lover who also happens to be a choc-o-holic then there is really only one place for you to go; Ghirardelli Square, (but remember no chocolate for the pup!). Strolling through Ghirardelli Square, located at 900 North Point Street was one of the most pleasant ways Beau and I spent an afternoon in San Francisco! An open air marketplace flanked by the old Ghirardelli Chocolate factory brick buildings, it is a lovely area. The market features a Chocolate Shoppe and Ice Cream Parlor of course, but also offers several wine shops with free wine-tastings, a fun upscale pet shop called YAP and a gorgeous water fountain that was filled with koi who kept Beau amused for at least 40 minutes. Get yourself an ice cream sundae and sit by the fountain...it's PAW perfection! San Francisco offers so many pet-friendly things to do that there are no fewer than two pet-centric free publications and numerous pet-friendly websites detailing what-in-the-Dog World is going on in San Fran! Bay Woof and Fetch are both free pet-centric publications in San Francisco and can be found at pet specialty shops, vets, super markets etc., so keep an eye out! Another place to find up-to-date San Francisco pet info is the website MyCityDog.com. The Argonaught Hotel’s nautical theme dominates throughout this Kimpton Hotel and so it should; ideally located on Fisherman's Wharf in San Francisco why wouldn't it? As with every Kimpton Hotel you can expect to find a wonderful pet program in place including a welcome pet amenity of a pet bed, a toy, and a treat at no additional charge. The Argonaught welcomes pet guests of all sizes and stripes, so keep an eye out. You never know what interesting pet will be around the corner! 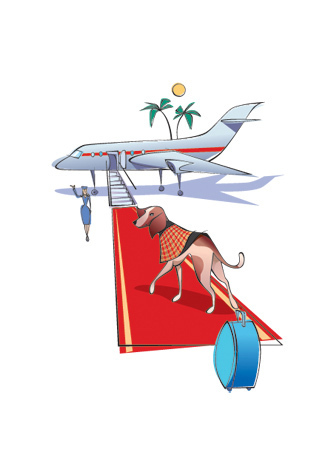 The Argonaught features one other element that makes staying there with your pet delightful; their well trained and genuine staff who will be truly happy to host you and your pet as their guests. The location of the Argonaught Hotel is also perfect for strolling Fisherman’s Wharf and within walking distance of Ghirardelli Square mentioned above.